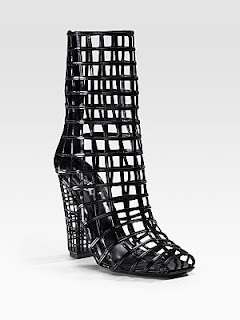 The YSL Spring 2009 cage shoes are being hailed as the shoe that will redefine how we see shoes. It's also been said that people will look back at 2009 and see this shoe as THE shoe of the year. I frankly don't get it. I understood the gladiator phase in 2008, I especially loved the Jimmy Choo version but this? I'm fairly ambivalent to it and don't get the hype. Absolutely in love with the boots! What great gifts to give oneself :). Check my shoes blogs.and give me some tips.